Abdominal Muscle Anatomy can be very complex, but let's just keep it simple here. The Abdominal Cavity is the region between the pelvis and the thorax. The diaphragm forms the top of the cavity and separates the abdominal cavity from the thorax and the pelvic floor muscles are the bottom of the abdominal cavity. There are 4 abdominal muscles that are in the anterior abdominal wall, and there are 4 abdominal muscles in the posterior abdominal wall. The anterior abdominal wall is what most people imagine when they think about abdominal muscle anatomy. The anterior abdominal wall consists of 4 muscles: the rectus abdominus, the external obliques, the internal obliques, and the transversus abdominus. The Rectus Abdominus is the muscle that is considered the 6 pack. 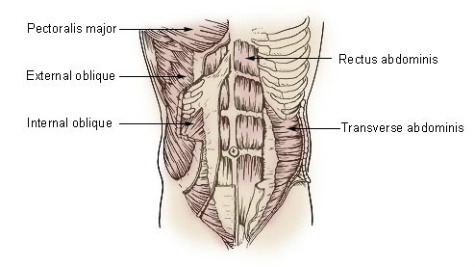 Rectus means "straight" and abdominus refers to "the abdomen". This muscle goes straight down the abdomen. It attaches to the ribs and the pelvis and pulls your body forward like in a crunch. It has little tendinous intersections that act to add leverage and give this muscle the 6 pack abs appearance. In regards to stability, it works with the other core muscles to keep the spine and pelvis stable. The External Obliques are just under the skin on your sides. They start on the back of the lower ribs and run on a diagonal down towards the pelvis. They pull the spine forward just like the rectus abdominus, but because they are oriented on an angle they also help to rotate and twist the spine. In addition, the external obliques help to bend the waist and spine to the sides. Your external obliques work the hardest when you twist or side bend. If you are really lean you should be able to see the rectus abdominus and the external oblique because these muscles are just underneath the skin. The next two abdominal muscles are underneath the first two so you cannot see them unless you do dissection. The Internal Obliques are underneath the external obliques. They start on the pelvis and run up towards the ribs in a diagonal line. They help to pull the spine forward like in a crunch, and they also help to twist and side bend the spine. Since they are deeper and closer to the spine than the external obliques, they play a slightly larger role in stabilizing the pelvis and spine. The Transversus Abdomnius is the deepest of the 4 anterior abdominal wall muscles, and it plays the greatest role in stabilizing the lower back. In fact it does not bend the spine forward like in a crunch, and it does not twist or side bend the spine. Its only job is to stabilize the lower back! Physiologist have also determined that the transversus abdominus is the first muscle that is activated during movements. In healthy people it contracts to stabilize the lower back before the arms and legs move. This is an important function, and people who suffer from lower back pain usually have delayed responses in the transversus abdominus, which means their spine is less stable. Physical Therapists use the Drawing-In Maneuver to re-train the transversus abominus. You cannot see the transversus abdominus if you look at someone because it is underneath the obliques. Here is a picture of all 4 anterior abdominal muscles. The posterior Abdominal Wall also contains 4 muscles. The 4 muscles in the posterior abdominal wall are the iliacus, psoas major, psoas minor, and quadratus lumborum. The Iliacus is a muscle that attaches the inside of the pelvis to the thigh bone (femur). It's main action is to bend the hip and bring your legs towards your chest. Bending the hip is also referred to as hip flexion, and the iliacus is one of the main hip flexors. The Psoas Major is a muscle that attaches all of the lumbar vertebrae to the femur. Just like the iliacus it also bends the hip and brings the legs towards to the chest. The Psoas Major actually joins with the Iliacus as it attaches to the thigh bone, so both muscles are often referred to as one muscle. 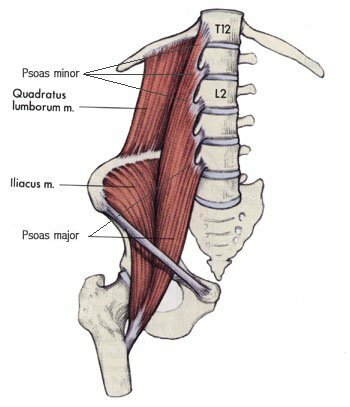 The iliopsoas is the name give to the iliacus and the psoas major, and together they are the strongest hip flexors in the body. Anytime you move your legs or hips during abdominal exercises, the hip flexors will work, and because the hip flexors (iliopsoas) attaches to the lower back and pelvis they can affect the position of the pelvis and lower back during abdominal exercises. The Quadratus Lumborum (sometimes referred to as the QL) attaches to the pelvis, lower rib, and lumbar vertebrea. It's located towards the side of your lower back. The Quadratus Lumborum helps to stabilize the pelvis, side bend the trunk, and extend the lower back. It will work during abdominal exercises that involve side bending or side support, and it is actually an important core muscle. The Psoas Minor is not pictured in the image below. The lines simply point to where it would start. It is considered a vestigial muscle which means that not everyone has it, and sometimes people will only have it on one side. The Psoas Minor attaches from the top lumbar vertebrae to the pelvis and doesn't really contribute much to core stability or movement. Below is a picture of the Posterior Abdominal Muscle Anatomy. The Posterior Abdominal Muscle Anatomy may be just as important and the Anterior Abdominal Muscle Anatomy. 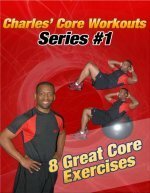 All of these core muscles must work together in a coordinated fashion to help our bodies move efficiently. This is a brief overview of the abdominal muscle anatomy, hip flexors, and 6 pack abs, and I hope it helps you to understand the orientation of the abdominal muscles.